Birth records for Hillsdale County are available from 1867 to the present, however they added a disclaimer stating that very early records are sometimes incomplete and hard to read. Death records are available from the same range of years, and marriage records are from 1835, 20 years before the county was actually founded, to the present. Divorce records, as well, are available from 1844 to the present. The Clerk also allows civil and criminal records searches for a per-search charge of $1 per name per year. Open during normal business hours, the office allows a maximum of two people in the research area at one time. It is located in Room 1 of the Hillsdale Courthouse, on 29 North Howell Street. 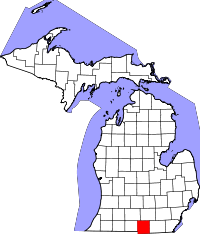 Hillsdale County, located in southern Michigan, borders both Indiana and Ohio, and is, in fact, the only county in the state to border two other ones.